Are you looking for tankless water heater services in Ashburn, VA? Millie’s Heating & Air Conditioning provides tankless water heater services throughout the Arlington, Ashburn, and Great Falls area, and our plumbers are qualified to provide you with all your service needs, from installations to repairs. 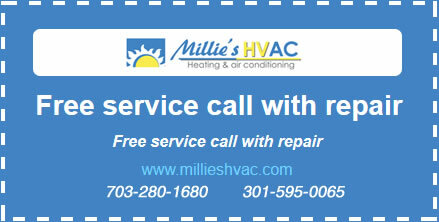 Call us today and find out why more customers in the area trust us to provide all of their plumbing and HVAC needs. Tankless water heaters can work as part of your home’s heating system to heat water, or they can be installed as individual heating units near the plumbing application, such as a kitchen sink or shower. Most homeowners choose to install a single unit for the entire home. In these types of units, the water is heated by a heating coil or heat exchanger installed in your furnace or boiler. While tankless coil water heaters are more efficient during the winter when the heating system is on, they can still work in the summer months. Call the tankless water heater experts at Millie’s HVAC if you would like to know more about the benefits of tankless water heating systems. If you have a water heater that’s old or needs repairs often, it may be time to replace it with a newer one, especially if your utility bills are always high. Tankless water heaters are highly efficient because they don’t use up extra energy to keep an entire tank of water at the desired temperature. The expert plumbing technicians at Millie’s HVAC are qualified to install many different models of tankless water heaters. We offer quality brands, and after we install your new equipment, we can help maintain it for the life of the system. Regular water heater maintenance is a great way to keep emergency repairs to a minimum. This type of service will also help your tankless water heater run more efficiently and extend the life of your unit, both of which save you money over the long term. Part of every maintenance visit is cleaning the actual unit. Even tankless water heaters need to be cleaned to ensure that there’s no calcium buildup. We can also repair all models, even if we didn’t install it for you. Call today for all your tankless water heater maintenance and repair needs! Whether you’re interested in a new tankless water heater or just need some minor repairs for your current water heater, Millie’s Heating & Air Conditioning is the company to call. We install, maintain and repair all types of water heaters, and we’ll help you make sure you get just the right one to provide for all of your household hot water needs. So no matter what type of tankless water heater service you are looking for, be sure to give us a call today.